Daraga is Bicolano for maiden. 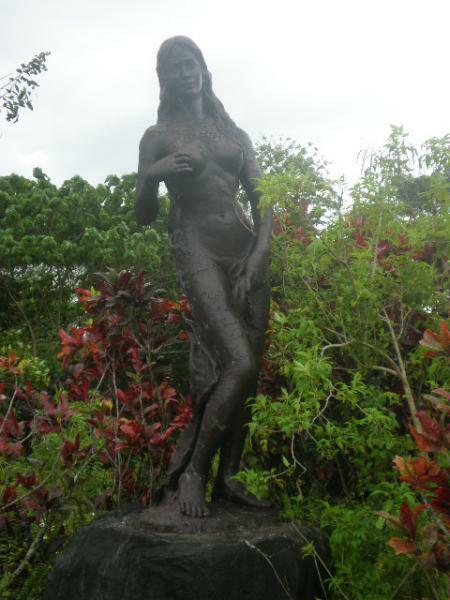 The town of Daraga, Albay was named after a heroine called Daragang Magayon. The love story of Daragang Magayon and her beau, Ulap, will rival that of Shakespeare's Romeo and Juliet. Legend has it that Daragang Magayon grew up to be a beautiful and good maiden, who caught the attention of suitors, far and wide. One suitor was Pagtuga -- a boastful hunk. To try to win the affections of Daragang Magayon, he would shower Magayon's father, Datu Makusog, with gifts of pearls and other gems. But this never won him a spot in Magayon's heart. Meanwhile, there was another debonair gentleman by the name of Ulap. At first, he would just take glimpses of the maiden while she bathed in the river. One rainy night, Magayon slipped and fell on the river's cold waters. Ulap immediately came to the rescue and carried her to dry land. That's how their courtship started. After several romantic rendezvous, Ulap declared his love for Magayon and asked for her hand in marriage. Magayon's father, knowing that his daughter would be happy as Ulap's wife, agreed. So, Ulap returned to the land of his kin to announce the news of his betrothal and prepare for the impending marriage. When Pagtuga heard this, he was enraged. He kidnapped Datu Makusog as the latter went hunting and held him hostage. As ransom, Pagtuga required that Daragang Magayon marry him. To save her father, Magayon agreed. When the marriage ceremony was about to start, Ulap and his men arrived. A battle ensued. As it wore on, Ulap finally slayed Pagtuga. Overjoyed that Ulap triumphed over Pagtuga, Daragang Magayon rushed to embrace her beloved. Alas, an arrow which was directed to kill Ulap, found its way through Magayon's back instead. Distraught over the event, Ulap wept as he cradled the dying Magayon. Oblivious to what was happening around him, another of Pagtuga's men drove a bolo through Ulap's back, killing him. Datu Makusog was so overcome with grief that he buried his only daughter with her beloved -- their arms entwined. As the days passed, the grave gradually rose to become Mt. Mayon. 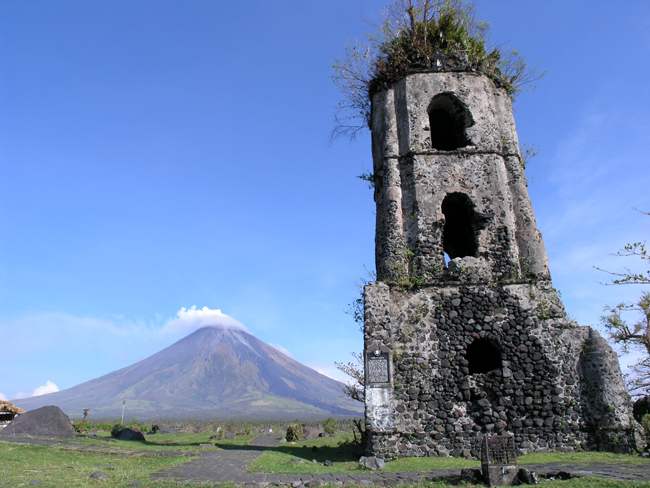 Even in the afterlife, the lovers' passion and devotion to each other is still fiery, as witnessed by the people of Albay and the ruins of Cagsawa Church. 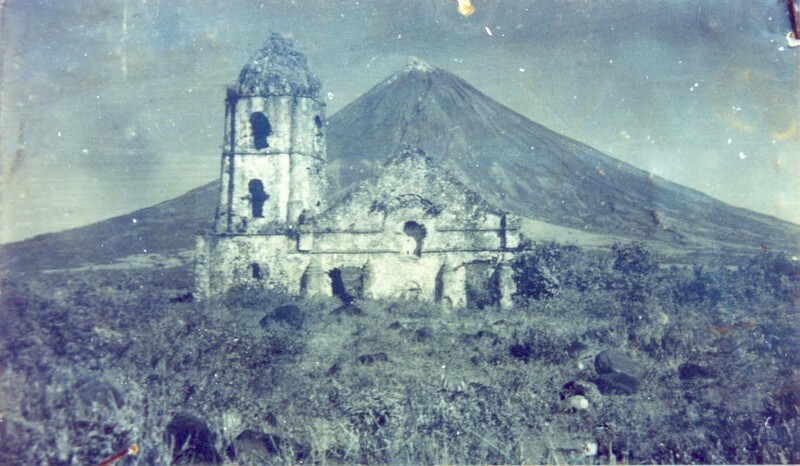 An old photograph showing what remains of Cagsawa Church after one of Mayon's several eruptions. It was taken sometime before the 1960s. The church was first erected in 1587 and was reconstructed in 1724 after having been destroyed by Dutch marauders in 1646. A postcard-perfect picture of the Cagsawa ruins. The Cagsawa church, having been destroyed in the 1814 eruption, has been converted into a park. The park displays products within Daraga and other areas in Albay, such as native bags and fans, sculptures and the region's delicacies. You can also get on an ATV and head to Mt. Mayon. Another church ruin is that of Budiao Church which is located several kilometers from the Cagsawa Ruins in Barangay Bañadero. Its walls look more like a fence rather than walls due to the growth of vegetation. ​Those who prefer to learn more about Bicol's past can head to the satellite office of the National Museum of the Philippines. To complete an architect's thirst for structures built in the past, the church of Nuestra Señora de la Porteria might quench this thirst. Visitors who prefer nature-built structures can enter the Nabasan and San Raphael caves as well as other interesting formations.